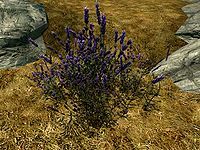 Lavender is an herb that flourishes in cold steppe climates, particularly in Whiterun Hold, but also in several other holds. Lavender is one of 4 items needed to cook a bowl of horker stew. Lavender is used in baking the Lavender DumplingHF. This page was last modified on 9 April 2018, at 05:17.